Gene: Want to do some of the requested songs? Joni: Let's see. What have we got here? "Night in the City," "Circle Game" -- oh, "From Both Sides, Now." I'm really glad somebody requested that, because that's a very new song, and I've been driving everybody crazy by playing it twice and three times a night. It's called "From Both Sides, Now." Gene: I haven't heard that one. Joni: I'll play that one first. It -- I should tell people a little bit about it. I was reading a book, and I haven't finished it yet, called "Henderson the Rain King." And there's a line in it that I especially got hung up on that was about when he was flying to Africa and searching for something, he said that in an age when people could look up and down at clouds, they shouldn't be afraid to die. And so I got this idea 'from both sides now.' There are a lot of sides to everything, and so the song is called "From Both Sides, Now." Gene: It's nice. That's a new one. Gene: How new is it? "This is a song that talks about sides to things. In most cases there are both sides to things and in a lot of cases there are more than just both. His and a hers. His and theirs. But in this song there are only two sides to things… there’s reality and I guess what you might call fantasy. There’s enchantment and dis-enchantment, what we’re taught to believe things are and what they really are." "A short time ago, a friend gave me a book called Henderson the Rain King and I started to read it but I never got finished; I got halfway through and sort of left the whole plot up in the air, literally, and got inspired to write the next song. Now, Henderson, the character in the book--is, was, one of those people who was born with everything going for them, at least it looked that way on paper. He was a multi-millionaire and, uh, that was a good start, I suppose. And, uh... But he wasn't happy. He'd been married twice and was contemplating a third marriage and wasn't really sure that he liked her very much. And he was very guilty about his wealth--because it was inherited. And so he tried to be earthy and get his hands into the soil. He tried pig ranching, he figured that was pretty earthy, and, uh, decided that he didn't like pigs either. "So one day his friends, who were about to leave for Africa on a honeymoon, said, "Well, why don't you come along with us?" And, uh, that sounds really peculiar but they were getting married for something like the third time themselves. So he said "Well, I'll go along with you" and he did. And while he was up in the plane to Africa to find out what life was all about for him, he looked out of the plane window and he said, um, you know, "Look at those clouds down there; it's very strange to look at the clouds from up above them. I remember as a boy having dreamed up at clouds a lot and having seen the cloud from both sides now, I suppose I shouldn't really be amazed by anything." And I like the idea of clouds from both sides and... (strums) some other things from both sides (tunes). I call my song "From Both Sides, Now." "Here's a song that has two names and they're both right: Clouds and Both Sides Now." Did you ever used to watch that show called Star Trek? (cheers from crowd) Oh... I just had a flash of this show, that I saw while I was singing this tune. It was the only show where Dr. Spock ever got any emotion, right? You remember that one? It was really great because... well, for those of you who never saw it, anyway, the premise is this: they're supposed to go and rescue an agricultural colony that's on some planet. They've been there for a while, they took some horses and they took some grain, they took a lot of that stuff, and they were going to experiment up there, maybe as an alternative planet, you know? When we mess this planet up too bad we'll have to go some place, right? So they were up there working kind of scientifically and all of a sudden, a message comes to Dr. Spock and the Star Trekkers that this planet is being bombarded by some kind of rays which are, uh, not very good for any kind of animal, vegetable... they're okay for mineral that's it--mineral life can live. So, it's getting bombarded so they all go down to check it out. First thing they notice is that there are no insects around, then they notice there are no animals around. And just when they're about ready to say that there are no people around, they discover this colony of people in the euphoric state, and not only that, when the doctor checks them out, every uh... history of any kind of disease that they've had, including things like appendectomies, has all disappeared, right? And they're in perfect heath. Well, what happens is, the reason Dr. Spock suddenly becomes a compassionate-feeling creature is 'cause one day with the youngest and the prettiest member of the scientific team, of course, he's walking through a field and he comes upon a whole kind of row of sunflower-looking creatures. And as he's walking through these sunflower-looking creatures, one of them explodes and shoots things all over him and then you see Dr. Spock lying down on the ground and looking up at the clouds--that's what made me think of this. He said to her, "Wow! I never looked at clouds like that before." (cheers from the crowd) He said, "There's a dinosaur up there, there's..." Then he turned to this girl and he said, "I love you." Meantime, his little radio is going "bleep bleep bleep" and he's supposed to get back to the ship and you know what he does? He shuts it off. The "Clouds" studio arrangement from 1969 is the one I like the best. Just Joni and her guitar, what more could you ask for? It was this version that introduced me to Joni and her music for the first time three years ago. I love this classic! To say that I love Joni and her music would be an understatement; 1976, and a blonde in college changed my point of view. She left me with Joni's music,and not much else. Looks like we have two birthdays coming up. I was born 13 days after you wrote this song to a 21 year-old mother. I didn't discover until tonight that you wrote Both Sides Now on March 9, 1967, at the age of 21. I have always really like this song for some reason. I knew I heard it when I was very young but didn't realize perhaps another reason I might have been drawn to it: we came into this world at the same time. Hard to believe we'll both be 47 years old and Joni will be . . . . Best wishes for many more. A masterpiece! But really, aren't they all masterpieces? This song will always have a special place in my heart. I remember being just about 4 years old, and this was one of the first songs I knew how to sing all the way through...mostly. 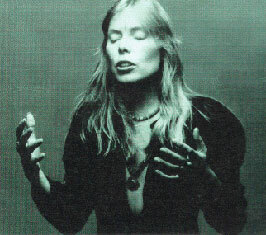 It was also the first Joni song that I was introduced to, and now she has changed my life through her beautiful music.